So you’ve got a bunch of projects on your plate. Each project is different – different building type, different client, different consultants and different building systems. Sounds familiar? How do you keep track of every little detail? How do you make sure nothing slips through the cracks? Sure you can keep a notebook and yes, you have project management software. 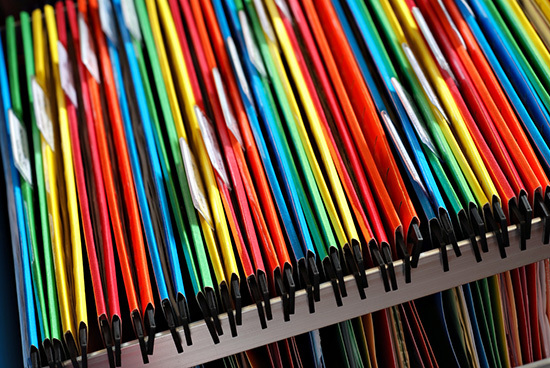 But how can you get an overview of all your project data? How can you keep track of everything? Mind maps are visual diagrams of information. They are tools for visual thinking and data management. Created using specific mind-mapping software, a mind map typically consists of a central topic with branches connecting multiple concepts or keywords. Topics can be arranged and re-arranged by dragging and dropping. The software maintains the relationship between the subtopic and its topic. Mind maps are effective because they match the way our brains work. The major benefit to architects is that mind maps are visual, rather than textual representations of information. Mind maps combine text, graphics, images and color into a single hierarchical structure that is spatial in nature. As architects, we’re used to dealing with graphics and drawings. We can see relationships in drawings more easily than in straight text. Mind maps combine textual and graphic information into a flexible structure that’s easy to work with. It’s the best of both worlds. Mind maps function like an outline. You can create a hierarchy of topics and sub-topics. You can collapse and expand the hierarchy as you go. You can also isolate specific branches of the map to really drill down into a topic. Most mind-mapping software comes with a host of graphic tools for highlighting relationships between topics. You can also specify a shape and color for each topic and sub-topic. This makes it easy to visually group related data. Mind maps are fluid and flexible. You can easily change and restructure a map by dragging and dropping sub-topics. This is why mind maps work great for brainstorming. This flexibility is also useful when you’re trying to organize and structure information. A lot of times, project information isn’t structured, or the structure is changing and evolving over the course of a project. Because a mind map is flexible, you can move, reorganize and re-associate your data as needed. I’ve used Mind Maps for a variety of purposes in my own practice. While doing material research for a large cultural project, I created a mind map to keep track of all my cut sheets and product information. 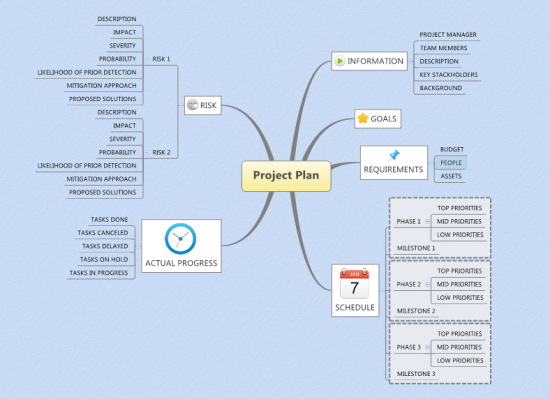 On this same project, I also created a mind map to keep track of all my tasks and open items. It works great for creating checklists. I could also see using a mind map to organize specifications. Given the hierarchical nature of a mind map, you could create the entire CSI numbering system as a mind map then add project specific links and data over the course of the project. Most mind-mapping software will export to multiple formats including MS Word and Excel. Mind maps can also be used for brainstorming sessions. 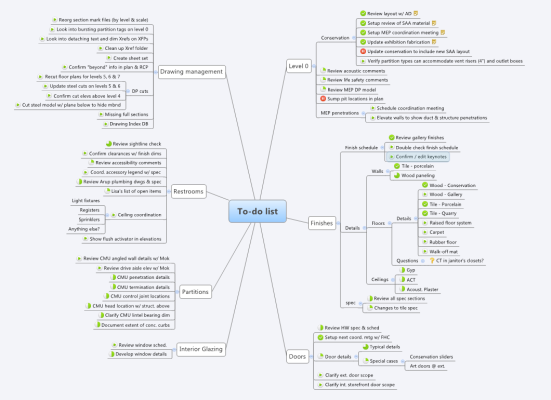 Rather than keeping notes, create a mind map and quickly insert topics and sub-topics as the session flows. As I mentioned earlier, most mind mapping software provides tools for linking and associating topics. Likewise, you can use mind-mapping software for taking meeting notes. Diagramming processes is also very easy with mind-mapping software. You can use a variety of shapes to identify each step in the process. There are a lot of mind-mapping software options. Some are online only while others install on your local computer. There are even mind-mapping apps for your tablet. I use XMind. It’s available for Mac and PC. There’s a free version or you can upgrade to the pro version. 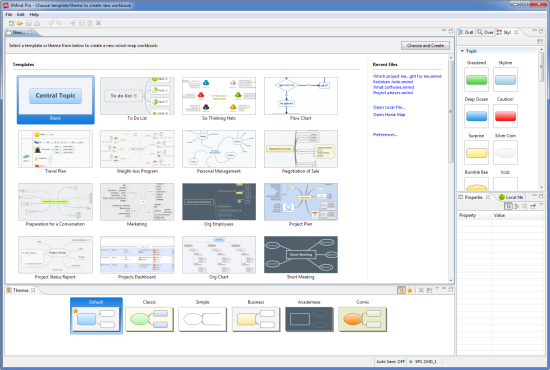 Some other good options are MindView, MindMeister, and iMindMap. 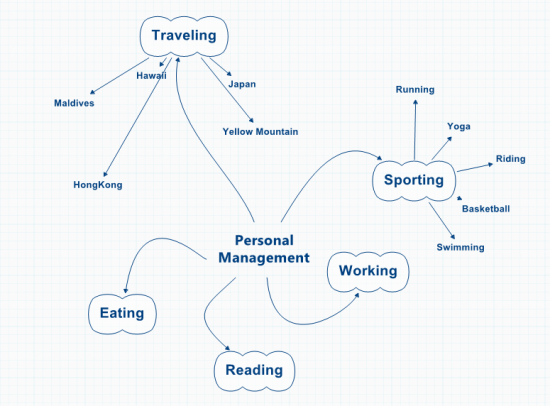 For even more options, check out Lifehacker’s Five Best Mind Mapping Tools. So how do you think you could use mind maps? Leave a comment with your suggestions. Thanks for writing about mind-mapping, it’s something I’m curious abut. I see people doing it as they take note at meetings and conferences. I have played with it a little myself (using MindMeister) but just haven’t yet found it to be a way that suits me yet. Saying that when I take notes on paper sometimes it ends up similar with arrowing linking notes together and similar! Yes, my hand-written notes often look like mind maps too. I often use mind-mapping software for keeping track of issues or tasks, particularly on large projects with multiple phases. I will also create a mind map when I’m outlining / brainstorming an article or presentation. The flexibility to move topics around is really helpful when you’re trying to work out an idea. I had a look at the lifehacker link and I must say http://coggle.it/ looks very appealing. It has the disadvantage of being a webapp though I guess, as I’m not always online. Great wrap-up of mind-mapping software from an architect’s perspective – I agree that they’re invaluable for structuring articles and presentations. I just started using XMind with some success although I’ve also had good luck using MindNode, which is a little more intuitive. It’s got a smooth interface and is easy to get attractive results. Unfortunately it’s iOS/Mac only at the moment. Thanks Neil! MindNode looks interesting. I like that it has iPad and iPhone versions. I’ll definitely check it out. I’d like to recommend Novamind (Mac and windows). I’ve been using it for years and it can do everything, and it does it well. They also have some training that led me to use their mindmapping techniques to take notes instead of traditional note-taking. Using those techniques I was able to spend far more time *listening* and absorb the lecture while still taking notes for the tests later. My semesters notes came to 27 double pages. I asked others in class how many they had: over a hundred in almost every case! One trick I’ll share here: use multiple colored pens; keeping topics arranged by color helps with the map in your head as you build the one on paper. Brett – Thanks for the suggestion. I hadn’t heard of Novamind before. I just downloaded the demo to check it out. Having tried Xmind, Freemind, and couple others I don’t remember, I ended up buying IThoughtsX on my mac and iThoughtsHD on my iPad. Both of them work very well for taking meeting notes and perfectly support the way my brain works, which can be described best as scattered! Thanks Matt. I haven’t tried that one. I’ll give it a look. I use Xmind, which I really like, but I wish it was available for iPad and Android. I’m not always at my computer when I need it most! Great article! I use mindmeister all the time and love it. Its a great way to brainstorm ideas, presentations, all sorts of things. Not having used mind-mapping software before, I can’t really comment. But I use workflowy as a more linear version of the mind-mapping examples you have above. It’s essentially a bullet-list to rule them all. It visually is less graphic than a true mind-map but it is infinitely expandable.